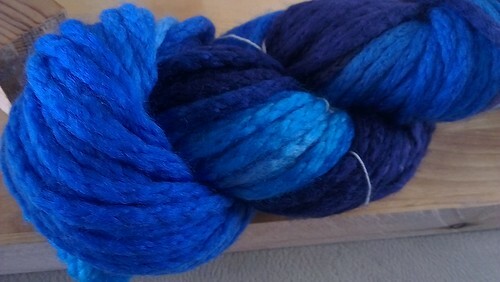 When I went to Get Knitted for Knatterers last week, I fairly fell over myself trying to get my hands on this yarn. It is so chunky and luscious! 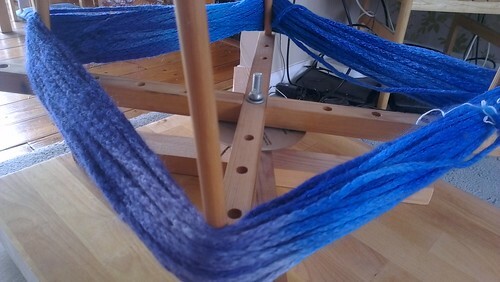 There are a lot of vibrant colourways, too. Naturally these blues had to come home with me but they did share table space with the teal/purple mix for the duration of the meeting, as I hummed and haaed over which one should come home with me and what it might become. It's Araucania Maipo, a yarn so new it had not made it onto Ravelry, as I discovered when I tried to look it up to see what I might knit with it. It comes with its own pattern booklet, which has lots of accessory patterns and a couple of garments if you fancy a splurge. Get Knitted are selling it for £8.95 a skein and it's about 50m, but I have a feeling that would go a loooooong way. I intend to knit a pair of mittens with it. I am thinking of experimenting with a slipped stitch pattern, perhaps a herringbone tweed I remember from one of my very first knitting projects. I want them to be long so I am going to use a skein for each one. SPLURGE!